FireFighter GL48 is a non-toxic, glycerine-based antifreeze for use in all types of wet fire sprinkler systems, including CPVC. 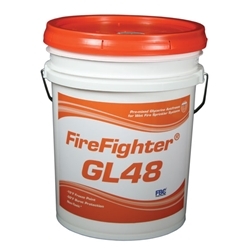 FireFighter GL48 is factory pre-mixed to NFPA guidelines of a 48% glycerine solution. All fire sprinkler systems utilizing FireFighter GL48 should conform to local, state, and NFPA requirements. The use of antifreeze within these systems should also conform to NFPA requirements.